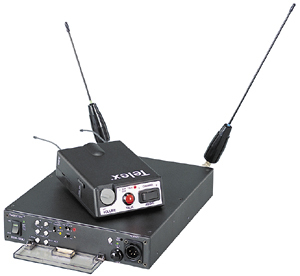 The BTR-500 series includes the BTR-500 frequency agile base station. The BTR-500 base station provides full duplex communications with a single belt pack, or can accommodate multiple belt packs operating in push to transmit mode. 16 BTR-600s (or more) may be operated simultaneously, permitting 32 (or more) discrete full duplex channels.